This eruption is primarily self-limited, and children eventually outgrow this disease, probably through desensitization after multiple arthropod exposures. [7, 8] However, adults can be affected, albeit at a much lower rate. Morphologic and immunohistochemical evidence suggest that a type I hypersensitivity reaction plays a central role in the pathogenesis of papular urticaria. The reaction is thought to be caused by a hematogenously disseminated antigen deposited by an arthropod bite in a patient who is sensitive. 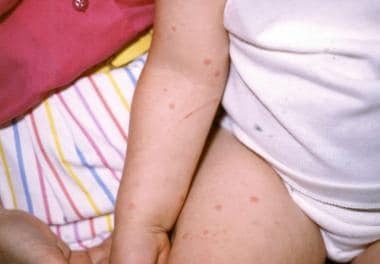 This theory is supported by the fact that these lesions can and often do occur in areas away from the bites. The putative antigen is unknown. Children, adult males, nonlocal inhabitants, and those belonging to urban or periurban areas may be more vulnerable to papular urticaria. Patients usually report chronic or recurrent episodes of a papular eruption that tends to occur in groups or clusters associated with intense pruritus. The most common first appearance is of papules and urticarial plaques in clusters over exposed and covered parts of the body. The histopathologic differential diagnosis of papular urticaria includes other spongiotic dermatitides, pityriasis lichenoides et varioliformis acuta, the pruritic papular eruption of human immunodeficiency virus (HIV) disease, and papulonecrotic tuberculid. Papular urticaria with marked spongiosis and a dense inflammatory cell infiltrate cannot be reliably distinguished from arthropod bites on clinical and histopathologic grounds. In a prospective study of papular urticaria that evaluated the histopathologic features of 30 affected patients, more than 50% of patients had mild acanthosis, mild spongiosis, exocytosis of lymphocytes, mild subepidermal edema, extravasation of erythrocytes, superficial and deep mixed inflammatory cell infiltrate of moderate density, and interstitial eosinophils. Immunohistochemical analysis revealed abundant T lymphocytes (CD45RO, CD3) and macrophages (CD68). B lymphocytes (CD20) and dendritic antigen-presenting cells (S100) were not seen. Direct immunofluorescence staining did not demonstrate immunoglobulin A (IgA), immunoglobulin G (IgG), IgM, C3, or fibrin. The occasional overlapping in histologic pattern between papular urticaria exhibiting the histologic features of pseudolymphoma and a true lymphoma can cause problems. Persistent nodules may suggest the possibility of a lymphoma, not papular urticaria, and require a skin biopsy specimen. The treatment of papular urticaria should be conservative and is symptomatic in most cases. Mild topical steroids and systemic antihistamines for relief of the itching that often accompanies this condition may be used. On occasion, papular urticaria may be severe enough to warrant the use of short-term systemic corticosteroids. If secondary impetigo occurs, topical or systemic antibiotics may be needed. Note that the use of insect repellents while the patient is outside and the use of flea and tick control on indoor pets are necessary when these individuals are being treated for papular urticaria. What is of papular urticaria? What is the pathophysiology of papular urticaria? What are the signs and symptoms of papular urticaria? Which conditions should be considered in the evaluation of papular urticaria? Which conditions should be included in the differential diagnoses of diagnosis of papular urticaria? Which histologic findings are characteristic of papular urticaria? How is papular urticaria treated? Stibich AS, Schwartz RA. Papular urticaria. Cutis. 2001 Aug. 68(2):89-91. [Medline]. Altraide DD, George IO, Frank-Briggs AI. Prevalence of skin diseases in Nigerian children--(the University of Port Harcourt Teaching Hospital) experience. Niger J Med. 2008 Oct-Dec. 17(4):417-9. [Medline]. Del Pozzo-Magaña BR, Lazo-Langner A, Gutiérrez-Castrellón P, Ruiz-Maldonado R. Common Dermatoses in Children Referred to a Specialized Pediatric Dermatology Service in Mexico: A Comparative Study between Two Decades. ISRN Dermatol. 2012. 2012:351603. [Medline]. [Full Text]. Sacchidanand S, Sahana MS, Asha GS, Shilpa K. Pattern of pediatric dermatoses at a referral centre. Indian J Pediatr. 2014 Apr. 81(4):375-80. [Medline]. Oninla OA, Oninla SO, Onayemi O, Olasode OA. Pattern of paediatric dermatoses at dermatology clinics in Ile-Ife and Ilesha, Nigeria. Paediatr Int Child Health. 2016 May. 36 (2):106-12. [Medline]. Lozano AM, López JF, Zakzuk J, García E. Papular urticaria: A review of causal agents in Colombia. Biomedica. 2016 Dec 1. 36 (4):632-645. [Medline]. Steen CJ, Carbonaro PA, Schwartz RA. Arthropods in dermatology. J Am Acad Dermatol. 2004 Jun. 50(6):819-42, quiz 842-4. [Medline]. Howard R, Frieden IJ. Papular urticaria in children. Pediatr Dermatol. 1996 May-Jun. 13(3):246-9. [Medline]. Lewis-Jones MS. Papular urticaria caused by Dermestes maculatus Degeer. Clin Exp Dermatol. 1985 Mar. 10(2):181. [Medline]. Garcia E, Halpert E, Rodriguez A, Andrade R, Fiorentino S, Garcia C. Immune and histopathologic examination of flea bite-induced papular urticaria. Ann Allergy Asthma Immunol. 2004 Apr. 92(4):446-52. [Medline]. Cuellar A, Rodriguez A, Rojas F, Halpert E, Gomez A, Garcia E. Differential Th1/Th2 balance in peripheral blood lymphocytes from patients suffering from flea bite-induced papular urticaria. Allergol Immunopathol (Madr). 2009 Jan-Feb. 37(1):7-10. [Medline]. Burns DA. Papular urticaria produced by the mite Listrophorus gibbus. Clin Exp Dermatol. 1987 May. 12(3):200-1. [Medline]. Yoshikawa M. Skin lesions of papular urticaria induced experimentally by Cheyletus malaccensis and Chelacaropsis sp. (Acari: Cheyletidae). J Med Entomol. 1985 Jan 18. 22(1):115-7. [Medline]. Jordaan HF, Schneider JW. Papular urticaria: a histopathologic study of 30 patients. Am J Dermatopathol. 1997 Apr. 19(2):119-26. [Medline]. Demain JG. Papular urticaria and things that bite in the night. Curr Allergy Asthma Rep. 2003 Jul. 3(4):291-303. [Medline]. Hossler EW. Caterpillars and moths: Part II. Dermatologic manifestations of encounters with Lepidoptera. J Am Acad Dermatol. 2010 Jan. 62(1):13-28; quiz 29-30. [Medline]. Bronstein DE, Cotliar J, Votava-Smith JK, Powell MZ, Miller MJ, Cherry JD. Recurrent papular urticaria after varicella immunization in a fifteen-month-old girl. Pediatr Infect Dis J. 2005 Mar. 24(3):269-70. [Medline]. Naimer SA, Cohen AD, Mumcuoglu KY, Vardy DA. Household papular urticaria. Isr Med Assoc J. 2002 Nov. 4(11 Suppl):911-3. [Medline]. Lembo S, Panariello L, d'Errico FP, Lembo G. Professional's and non-professional's papular urticaria caused by Scleroderma domesticum. Contact Dermatitis. 2008 Jan. 58(1):58-9. [Medline]. Corazza M, Tassinari M, Pezzi M, Ricci M, Borghi A, Minghetti S, et al. Multidisciplinary Approach to Pyemotes ventricosus Papular Urticaria Dermatitis. Acta Derm Venereol. 2014 Feb 26. 94(2):248-249. [Medline]. Heng MC, Kloss SG, Haberfelde GC. Pathogenesis of papular urticaria. J Am Acad Dermatol. 1984 Jun. 10(6):1030-4. [Medline]. Cuellar A, Rodriguez A, Halpert E, et al. Specific pattern of flea antigen recognition by IgG subclass and IgE during the progression of papular urticaria caused by flea bite. Allergol Immunopathol (Madr). 2010 Mar 11. [Medline]. Dominguez-Amorocho O, Duarte S, González JM, Halpert E, Ortega MC, Rodríguez A, et al. Differences in Systemic and Skin Migrating-Specific CD4 T Cells in Papular Urticaria by Flea Bite. Int Arch Allergy Immunol. 2012 Sep 25. 160(2):165-172. [Medline]. Sabogal P, Lozano A, Mercado D, Cantillo JF, Moncada L, Quiñones ML, et al. Cellular and Humoral Responses to Cte f 2, a Cat Flea Allergen, in Children with Papular Urticaria. Int Arch Allergy Immunol. 2019 Mar 22. 1-13. [Medline]. Raza N, Lodhi MS, Ahmed S, Dar NR, Ali L. Clinical study of papular urticaria. J Coll Physicians Surg Pak. 2008 Mar. 18(3):147-50. [Medline]. Kar S, Dongre A, Krishnan A, Godse S, Singh N. Epidemiological study of insect bite reactions from central India. Indian J Dermatol. 2013 Sep. 58(5):337-41. [Medline]. [Full Text]. Keller EC, Tomecki KJ, Alraies MC. Distinguishing cellulitis from its mimics. Cleve Clin J Med. 2012 Aug. 79(8):547-52. [Medline]. Alpern JD, Dunlop SJ, Dolan BJ, Stauffer WM, Boulware DR. Personal Protection Measures Against Mosquitoes, Ticks, and Other Arthropods. Med Clin North Am. 2016 Mar. 100 (2):303-16. [Medline]. Halpert E, Borrero E, Ibañez-Pinilla M, Chaparro P, Molina J, Torres M, et al. Prevalence of papular urticaria caused by flea bites and associated factors in children 1-6 years of age in Bogotá, D.C. World Allergy Organ J. 2017. 10 (1):36. [Medline]. Giraldi S, Ruiz-Maldonado R, Tamayo L, Sosa-de-Martinez C. Oral desensitization in papular urticaria in children. Trop Doct. 2002 Jul. 32(3):142-5. [Medline]. The authors and editors of Medscape Reference gratefully acknowledge the contributions of previous authors Adam S Stibich, MD, and Christy Shaffer, MD, to the development and writing of the source article.